Vintage, colorful, milk glass oh my!!! 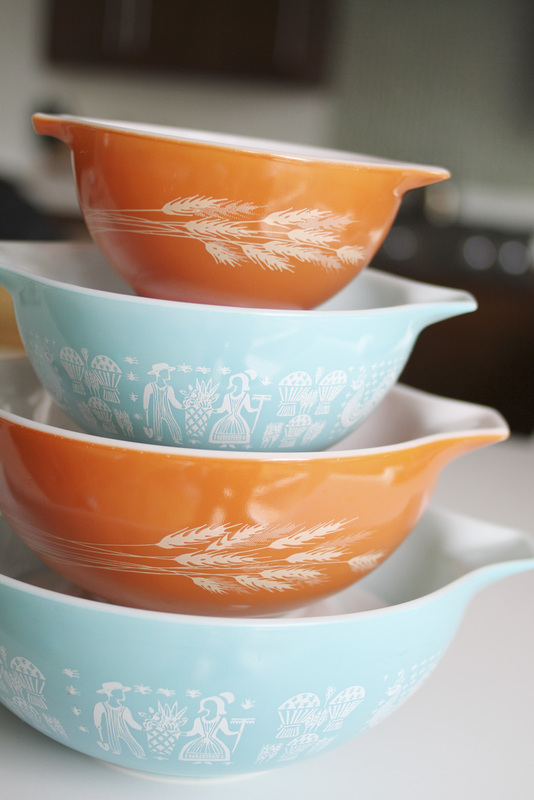 !Is anyone else as into vintage Pyrex as I am??? The colors and prints are just too cute to be ignored in any thrift or antique shop! 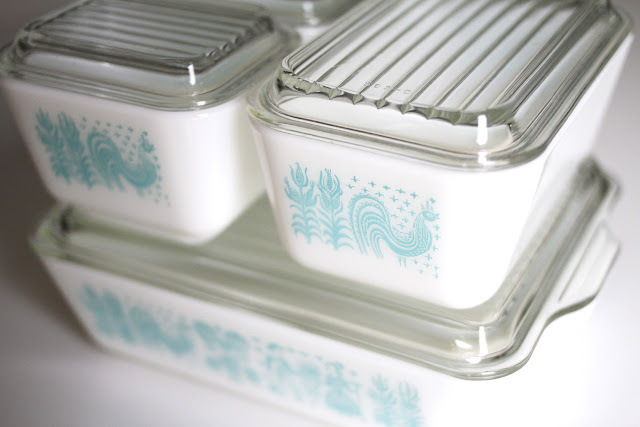 From the tiny little butter dishes to the large clear glass covered baking dishes, I wish I had an entire set... In every color! I would love it if Pyrex brought back some of these styles! But, come to think of it, maybe I'd rather have the 50 year old stuff. Why? Because each vintage dish tells a story. A story of life less complicated. Those dishes have me imagining whole families, sitting around the dinner table, on a week night no less, enjoying conversation about the days events. No tv, iPods, nintendo ds or smartphones to distract from that precious time! And although I love my tv, iPod and smartphone just as much as the next person, I think they should all be banned from the dinner table! I need that precious time with Kimble and our kiddos! Time to relax a little, laugh, obviously eat, and let our lil guys tell us all about their adventures during the day! I wish I could tell you this is how dinner is at our house 100% of the time! But I'd be lying through my teeth if I did! We are a "work in progress.":). It's amazing what a little vintage Pyrex will do for my perspective! Pyrex collecting has been a fun little hobby for me! I will occasionally get on ebay or ksl to see what I can find and so far, I've had pretty good luck! Although my stomach lurched when my husband opened one box to find a bowl I had got on ebay, shattered into tiny little pieces! :( BUMMER! So far I'm happy with the collection I've started! that refrigerator set is GORGEOUS! swoon. i love old pyrex. it's fun to still use the set my mom got 30(ish) years ago and know that it's been around as long as i have. I love the bowls you got me for my birthday! Thanks again. Dude, cutest collection ever! Good finds! Love that you are collecting this. Makes me want to start my own collection. I love any kitchen gadgets I have inherited from grandparents. Vintage aspirants have been following all the goals for the success of the society. Yes, this has been ensured for the demand seekers in the field of eatables in order to fulfill the appetite for the future goals.